It's a beautiful day, and it will be an even better night once GM Jason Botterill and the Buffalo Sabres entourage head up to the podium in Dallas, TX to select Rasmus Dahlin first-overall in the 2018 NHL Draft. For the organization, it's the opportunity to put seven years of rebuilding angst, anger and frustration in the rear view mirror and start heading towards the future. It was a stretch that hopefully will be forgotten soon and like a bad relationship that went on way too long, time will have healed all wounds with the pain and apathy of those years reduced to an unpleasant memory. Forgive me for waxing poetic. I know I've been there before when we thought we said goodbye to the tank years with the 2015 draft-day makeover highlighted by the selection of Jack Eichel second overall. It didn't work, and with the trades that former GM Tim Murray made to augment Eichel and 2014 second-overall pick Sam Reinhart being moved on from, it's Botterill's gig and things seem to be going very well for him. In the last two blogs we looked at a very thin prospect pool in goal, which will be taxed even further as the Sabres will not qualify RFA starting goalie Robin Lehner, and a pretty thin collection of defensemen. Luckily for Buffalo they won the lottery and the selection of Dahlin will not only help the d-corps fall into place, the Sabres also have the option of keeping their top d-prospect, Brendan Guhle in Rochester at least for some of the season. The forward group has been much maligned for their lack of top-level talent and overall speed. While the latter is true from a physical standpoint, they may have been more the victim of playing the game slower. Most forwards on the Sabres last season had NHL skating ability, but the mess that was the team, which included a rookie coach in Phil Housley wouldn't allow for playing the game at a faster pace. That will change beginning this season as the forward group should see an influx of both speed and talent, albeit those two traits being mutually exclusive in some of the players that will be in Buffalo next season. Who will be a part of the opening day roster is still up in the air beginning with Ryan O'Reilly and stretching down to Zemgus Girgensons and Johan Larsson. For as much grief as Murray got for his trades, and it's warranted as all three of his big-time acquisitions may be gone after only three years, his drafting was pretty solid. That includes the aforementioned Guhle (2015, second round) plus D, Will Borgen (2015, fourth round) and a few players that are apart of our Top-7 forwards to keep an eye on. Having said that, the top forward prospect that has all of Sabreland quite excited is a 2017 pick from Botterill's first draft as a GM. How many times have you heard "I can't believe he dropped to us there" when talking about a prospect at the draft. Such was the case with Mittelstadt as many viewed him as a top-five pick but the Sabres were able to land him at No. 8. The 2017 Mr. Hockey winner from Eden Prairie High School in Minnesota joined the NCAA's Minnesota Golden Gophers for one season before signing his entry-level deal with the Sabres in March. He played in six games for Buffalo registering his first NHL goal and adding four assists. There's a lot to be excited about when it comes to Mittelstadt and what he has to offer. He's got size (6'0" 199 lbs.) and plenty of skill (11 goals and 30 points in 34 games as a freshman for the Gophers) to go along with his excellent skating ability. Although he isn't the fastest he's pretty quick to areas and his hockey sense allows him to play the game at a faster pace. Mittelstadt faced a lot of rugged defensive hockey in the BIG 10 last season and had plenty of gumption to get where he needed to go, which were often the dirty areas of the ice, and find the player in open space. Where he plays next year in Buffalo is wholly dependent upon O'Reilly. Should they trade the veteran center, Mittelstadt will be looked to as the team's No. 2 center but should O'Reilly stay, it's likely that he'll be moved to third-line center. Although I wouldn't completely rule out the possibility of him getting time on the wing in that scenario. The Sabres will be adding two high-end prospects this season in Dahlin and Mittelstadt. It's a duo that has those of us in Sabreland pretty excited. Is Malone the No. 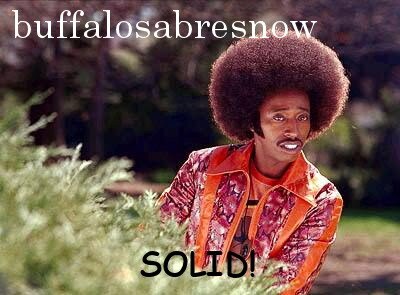 2 forward prospect for Buffalo? No, not by any stretch, but this isn't about ranking prospects, its about prospects to keep an eye on and he looks like he'll be knocking on the door of the NHL this coming season. The West Seneca, NY native was more that a token local pick when the Sabres snagged him in the sixth round of the 2013 NHL Draft. The solid 6' 0" 190 lb two-way center left Nichols High School and embarked on a collegiate career at Harvard. While with the Crimson he scored 42 goals and 99 points in 115 games which included a 18-goal, 42-point breakout in his senior season. Malone got a one game taste of the NHL at the end of the 2017-17 season and spent last year in Rochester. After adjusting to the speed of the pro game, Malone ramped up his game to the point where he said he felt like himself. That player he's talking about plays a 200' game with a lot of speed and determination. Although he doesn't have the skill-level to crack the top-six or even top-nine, once he gets up to speed at the NHL level, Malone has the ability to be a stalwart and clutch faceoff guy in a fourth-line checking role. Smith is another player who isn't top-three amongst the prospect rankings, but one we should keep an eye on heading into the season. The Sabres have no left wingers to speak of and the U-Mass Lowell product showed plenty of skill and speed to be considered for the openings on Buffalo's left side. At 5'11" 185 lbs. Smith doesn't have ideal NHL size, but he proved last season he could hang with the big boys at the pro level. Smith tied for second on the Amerks with 17 goals and was third on the team in scoring with 44 points, which tied him for 10th amongst rookies in the AHL. In addition to his skills on offense, Smith plays a solid two-way game and is strong on the defensive side of the equation. 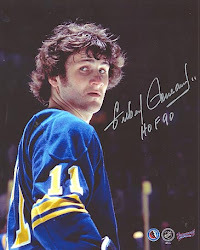 What he has to offer at the NHL level is still unknown but he has a nice foundation with which to build upon, quite possibly in a third-line left wing role for the Sabres. What was said about Smith's opportunity on the left side in Buffalo is also true for Nylander. So why is an eighth-overall pick behind a free agent who plays the same position? It's how the two seem to have approached the game in Rochester. As a free agent, Smith had a lot to prove whereas Nylander comes off as a player who's been in prima donna mode. Nylander may have had the highest skill-level at the 2016 NHL Draft but the knock on him was that he disappeared, something we've seen in Rochester the last two seasons. In 116 games for the Amerks he's scored only 18 goals and 55 points. Put that up against what Smith has done in less than half the games. Having said that, it's still a bit too early to give up on him. Nylander is an extremely gifted hockey player who has all the tools to take a spot in the top-six. But until he gets his head on straight, he's looking more like a bust than he is an NHL player. There has been a lot of anticipation with Asplund and when he would finally arrive in North America and the reason for it was his exceptional play at the pro level in his native Sweden. Asplund won't wow you with his stats (8+20 in 50 games for Färjestad BK last season) but he does everything else extremely well. "He's quick and shifty, using his speed and turning ability to gaine time and space," reported The Draft Analyst, and he plays a full 200' game. Asplund is not afraid of the dirty areas on the ice and has a high compete-level. Should he continue to develop properly, Asplund has all the attributes of a top-end, third-line center. The right side of Buffalo's forward group is pretty full right now with Reinhart, Kyle Okposo and Jason Pominville in the top nine and Baptiste hasn't had much time, if any, on the left side. That makes for a pretty tough road to hoe for him. At this point in his career, the 22 yr. old Baptiste is out of waiver options so if the Sabres want to keep him, he'll need to stay in Buffalo or they risk losing him. It's been a pretty choppy ride for Baptiste thus far in his pro career as he's spent most of it in Rochester. His AHL stats are decent (38+31 in 121 games) and he's managed seven goals (plus four assists) in 47 NHL games. But he just hasn't been able to break through quite yet. We've seen spurts of what Baptiste can be as he has plenty of speed and can score from all areas using a wide array of shots. It's consistency that's lacking in his game, which is typical of young player and if he ever gets that ironed out, because of the speed and skill he has, Baptiste could be a force in the top-nine or even top-six. He's got a lot riding on this season and it would behoove him to have a great camp and bust his way into the top nine. Although there hasn't been much anticipation about Olofsson making his North American debut prior to last season, the numbers he put up in 2017-18 certainly raised some eyebrows. Olofsson was a beast in Sweden with Frolunda as he lead the SHL with 27 goals while finishing with 43 points. It took the 5'11" 172 lb. sniper three full seasons to break out in Sweden's top league but did so in style as he finished with the Håkan Loob Trophy for most goals scored in the season. Frolunda used him in the circle on the powerplay where Olofsson unleashed a deadly shot and there's no doubt that he's one of the most skilled shooters in the Sabres prospect pool. Can he find his place in Rochester playing on the smaller North American rink is one of the questions with Olofsson as is how he'll be able to keep his smaller frame out of trouble with the bigger, stronger, heavier competition in the AHL. That said, having an influx of talent like his should bring good things for the Amerks and hopefully , Buffalo as well.